This unit is made to be used dry. If used with water extra cleaning charges will apply. 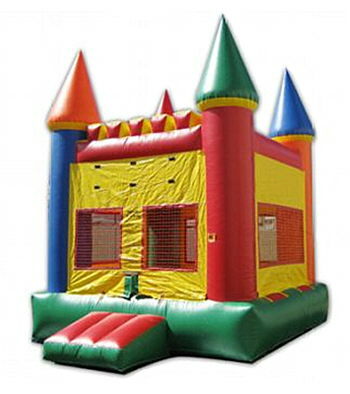 Flame resistant, inflatable 13 X 13 red, blue & yellow blow up castle. A party favorite for kids of all ages. Fun for kids parties, carnivals, fundraisers & graduation parties etc. Can Handle 3-5 Adults or 6 7-8 year olds at a time. We include the dollie to move it and stakes to stake it down. It should be set up on grass or if on hard surfaces, put a tarp under the ride. Can do delivery outside of Ft. Collins, call for pricing. Silly string can have some major effects on a bounce house and do serious damage. There is a chemical in silly string that causes silly string to adhere to an inflatable when it comes in contact with it. This chemical will then burn into the unit causing a wept mark on the unit similar to a burn scar. $50.00 deposit required when reservation is made. Reserve your Inflatable Bounce House Dry for your party or event today! Best Event Rentals is a Fort Collins, Colorado based rental company but we also service: Loveland, Windsor, Greeley, Wellington, Estes Park, Red Feather, Laramie WY and even Cheyenne WY. Give us a call to see if the Inflatable Bounce House Dry is available for rent. We've rented Best Rental's bounce castle numerous times and my kids just love it.